Yes. I just thought it was something of a PR coup to have the H&C station closed this particular weekend. I will do some actual coverage of the project when I dig up some decent information on it. It's a pretty clever PR coup then. 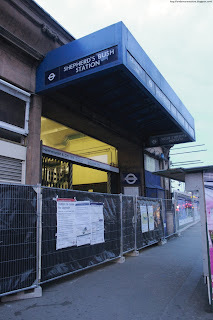 Even people who were aware of the two equally named yet separate stations will feel relief when the H&C one is renamed Shepherd's Bush Market. It's a good thing they are finally fixing up this grotto pretending to be a tube station. Just hope they do a proper fix up, not just the escalators and the ticket hall but platform level as well. Better do it now instead of in a year when the station will have become twice as busy. I am surprised you have not had more to say on this closure. The local MP, Andy Slaughter, and local website http://www.shepherdsbushw12.com/ have been up in arms. Is it true this is the only station to be closed for escalator refurbishment? Is it true there will be no extra capacity? Its incredible to think such an important local station is going to be closed for so long at the behest of the property developers. London Underground have seriously failed here. across the green and back to get close to that single escalator. And what should it do, only allowing people up or down? Have your pick. Secondly, the entire ticket hall is going to be replaced. It is not just an escalator replacement. Thirdly, Shepherd's Bush is now a relatively quiet Tube station, it is not up there with the busy ones, however busy it may seem to people using it now. 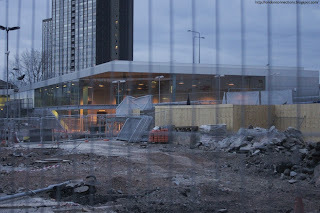 Now, when Westfield shopping centre opens and the interchange with Shepherd's Bush London Overground station adds traffic, usage of the station is expected to explode making it far busier than it is at present. It only makes sense doing a major upgrade to the station while it is still relatively quiet before this usage explosion. Unlike this MP, TfL actually thinks about things and tries to make disruption as minor as possible. I don’t think there has been hype about the closure. I think there has been a raft of legitimate points made which TfL don’t have answers for. Essentially, TfL contracts didn’t complete their work on time. The local Council hasn’t started their highway works for the new development on time either. Westfield has kept shifting the goal posts on their development resulting in programme of works constantly changing to. Westfield has also failed to undertake work required for them to meet their legal requirements to improve public transport facilities as required by their development approvals. To solve these problems and ensure that the centre is open for the 2008 Christmas mega-spend, Westfield has thrown masses amounts of cash at TfL and the Council to get the job done – whatever the cost. This means no consideration and maximum inconvenience given to local residents and commuters, no forward planning, no thinking about the implications and rash ill-advised comments and justification from TfL and the Council. Big business has effectively bought public organisations without those organisations giving any consideration to those they serve. This is setting a dangerous precedent for democracy in London. Whilst I accept that there are other tube stations within a ten minute walk – after you have worked a 10 hour day, it is nice to have a two minute walk to your front door rather than a 15 to 20 minute. This is especially the case when the weather is rubbish. Remember – London property prices are based on how close to a tube station you are – the further away the less you pay! I guess it is easy for people not affected to say “get over it” but they must remember the way TfL and the Council has gone about this process. I also feel there is a significant different between this closure of a tube station and the forced 3-month suspension of a line due to faulty trains. Whilst we all managed – it did make life difficult and resulted sacrificing the work-life balance. Also, TfL compensated commuters for this. Something they refuse to do this time. I'm a Bush boy proper, born n raised, and I for one am THRILLED that TfL are closing the Central line station. Presently, it's both cramped, degraded and tacky. Altho i'm gutted to see its demise in a way, when you reflect on the fact that this is not the first incarnation of a station on this site, the old station used to be called Uxbridge Road, and was just a wooden shack above the tracks [of the West London Line -no Central yet! infact the "new" London Overground station is a re-installation of this original station! ], this was demolished for the station building we know [and some loved] due to the gentrification and rising popularity of the area, not to mention the arrival of the new Central London Railway [aka- Two-Penny Tube / Central Line]. So Shepherds Bush has been growing in popularity for many decades, and now the funds and impetus have finally arrived in the form of a major development The Westfield White City complex. The council [LB H&F] and TfL would be entirely neglectful and ignorant of the changes due and effects of the development to the area, and specifically to the demands placed on the transport infrastructure at Shepherds Bush. And so I applaud Westfield, TfL and LBH&F for taking this brave step to make dramatic and lasting improvements to the area. The fact that not just one project is happening here [besides the Westfield re-development complex itself], Shepherds Bush Central line station is undergoing 1, a MAJOR rebuilding of the ticket hall [Westfield], 2nd major DDA compliant upgrading of the station platform and access areas [Tfl & LU ltd] 3rdly the maintenance and restructuring of the Uxbridge Road [LBH&F]. and so the these projects have been planned to coincide, and run for 8months so as to cause less frustration and disruption [albeit still causing CONSIDERABLE disruption!!]. infact, TfL were gonna close it part-time for 2-3years in about 1-2years, how much more aggravating would that have been?! WELL DONE TFL! I look forward to reaping the rewards of the new station and a much more pleasant station experience once the rebuild is complete. I'll be the mid-October WAITING with my permit to travel [ticket!!] in hand and camera in the other. 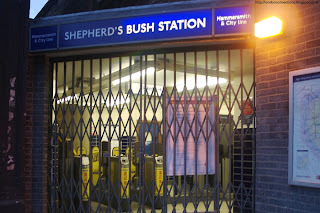 The post is meant to show all three "Shepherd's Bush" stations out of action.